Inscription about Tiberius Claudius Balbilus of Rome (died c.AD 79), which confirms that the Library of Alexandria must have existed in some form in the first century (on 5th line: "ALEXANDRINA BYBLIOTHECE"). The ancient Library of Alexandria was a large and significant library of the ancient world. It was founded in Alexandria, Egypt. The Library flourished under the patronage of the Ptolemaic dynasty and functioned as a major center of scholarship. It was built in the third century BC. 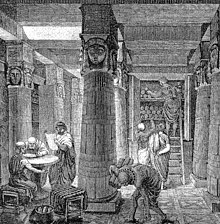 In ancient Latin, the library was known as the "ALEXANDRINA BYBLIOTHECE" (see image at right). The Greek term bibliotheke (βιβλιοθήκη), used by many historians of the era, refers to the collection of books, not to any building. This complicates the history and chronology. The library was conceived and opened either during the reign of Ptolemy I Soter or during the reign of his son Ptolemy II. Plutarch (AD 46–120) wrote that during his visit to Alexandria in 48 BC, Julius Caesar might have accidentally burned the library when he set fire to his own ships to frustrate Achillas' attempt to limit his ability to communicate by sea. According to Plutarch's account, this fire spread to the docks and then to the library. However, this version of events is not confirmed in contemporary accounts of Caesar's visit. In fact, it has been reasonably established that segments of its collection were partially destroyed on several occasions before and after the first century BC. A modern view attributes the destruction to Coptic Christian Archbishop Theophilus of Alexandria in 391, who called for the destruction of the Serapeum -- the Daughter library and a temple to the god Serapis. The Ancient Library of Alexandria. According to the earliest source of information, the library was initially organized by Demetrius of Phaleron, a student of Aristotle, under the reign of Ptolemy I Soter (ca.367 BC—ca.283 BC). The library comprised a peripatos (walk), gardens, a room for shared dining, a reading room, lecture halls and meeting rooms. However, the exact layout is not known. This model's influence may still be seen today in the layout of university campuses. The library itself is known to have had an acquisitions department (possibly built near the stacks, or for utility closer to the harbour), and a cataloguing department. The hall contained shelves for the collections of scrolls (as the books were at this time on papyrus scrolls), known as bibliothekai (βιβλιοθῆκαι). It was rumored that carved into the wall above the shelves, a famous inscription read: The place of the cure of the soul. It was the first known library to gather a serious collection of books from beyond its country's borders. The Library was charged with collecting all the world's knowledge. It did so through an aggressive and well-funded royal mandate involving trips to the book fairs of Rhodes and Athens and a policy of pulling the books off every ship that came into port. They kept the original texts and made copies to send back to their owners. Alexandria, because of its man-made bidirectional port between the mainland and the Pharos island, welcomed trade from the East and West, and soon found itself the international hub for trade, as well as the leading producer of papyrus and, soon enough, books. Callimachus, (early third century BC), the first bibliographer and developer of the Pinakes - the first library catalog. Aristarchus of Samothrace (late second century BC). Already famous in the ancient world, the library's collection became even more storied in later years. Papyrus scrolls comprised the collection, and although parchment codices were used predominantly as a more advanced writing material after 300 BC. A single piece of writing might occupy several scrolls. King Ptolemy II Philadelphus (309–246 BC) is said to have set 500,000 scrolls as an objective for the library. Mark Antony supposedly gave Cleopatra over 200,000 scrolls (taken from the great Library of Pergamum) for the library as a wedding gift. Carl Sagan, in his series Cosmos, states that the library contained nearly one million scrolls, though other experts have estimated a smaller number. No index of the library survives, and it is not possible to know with certainty how large and how diverse the collection may have been. A perhaps exaggerated story concerns how the library's collection grew so large. By decree of Ptolemy III of Egypt, all visitors to the city were required to surrender all books and scrolls. Official scribes then swiftly copied these writings, some copies proving so precise that the originals were put into the library, and the copies delivered to the unsuspecting owners. This process also helped to create a reservoir of books in the relatively new city. According to Galen, Ptolemy III requested permission from the Athenians to borrow the original scripts of Aeschylus, Sophocles and Euripides, for which the Athenians demanded the enormous amount of fifteen talents as guarantee. Ptolemy happily paid the fee but kept the original scripts for the library. The Bibliotheca Alexandrina was inaugurated in 2002 near the site of the old library. ↑ Pollard, Justin, and Reid, Howard. 2006. The Rise and Fall of Alexandria, Birthplace of the Modern World. ↑ Letter of Aristeas, 9–12. ↑ Manguel, Alberto. 2008. The library at night. New Haven: Yale University Press, p26. ↑ Erksine, Andrew. 1995. "Culture and power in Ptolemaic Egypt: the Museum and Library of Alexandria". Greece & Rome, 2nd ser., 42(1), 38-48. ↑ Whibley, Leonard 1916. A companion to Greek studies. pp122–123. ↑ Tarn, W.W. 1928. Ptolemy II. The Journal of Egyptian Archaeology, 14(3/4), 246-260. The Byzantine writer Tzetzes gives a similar figure in his essay On Comedy. ↑ James Burke related this story in Episode 2 of Connections Series 1, "Death in the Morning". This page was last changed on 9 March 2015, at 09:06.